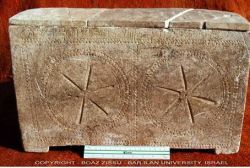 I will be joining Drew Mariani to discuss an antiquity found in Israel, an ossuary with the priest Caiaphas’ name. Safe to Go to the Holy Land? 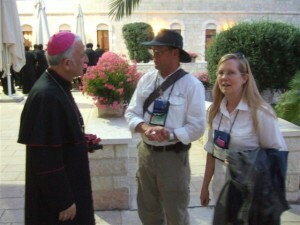 ROME, SEPT. 1, 2011 (Zenit.org).- There is nothing to fear in the Holy Land and no reason to halt pilgrimages, according to the Franciscan Custos, Father Pierbattista Pizzaballa. Father Pizzaballa stressed safety when he made an appeal on Vatican Radio on Wednesday to increase the number of pilgrimages to the land of Jesus’ birth. There has been a marked decrease in the number of pilgrims over the past four months, the priest reported. He proposed that the reasons for this can be traced to the global economic situation, but also to false perceptions linked to the political instability in Arab countries. Auxiliary Bishop William Shomali of the Latin Patriarchy of Jerusalem echoed Father Pizzaballa’s appeal. “The Holy Land and the pilgrims’ sites are safer than ever,” he said.